Although Cilantro and Coriander are the same plant (depending on if you are using the leaf or the seed), 'Leisure' is a richly flavorful slow bolting strain selected for consistent leaf production. 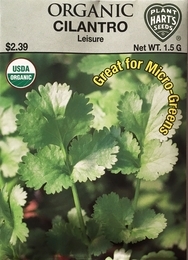 Cilantro is a popular baby or micro-green. Planting time - succession planting every 2 weeks from early spring into late summer will provide a continuous harvest of fresh leaves. Germinates in - 15-20 days - Cilantro prefers cool temperatures and plants may bolt to flower quickly when soil temperatures are above 70 degrees. Thinning - when plants are 2-3 inches tall, thin out extra plants by cutting them off at the soil line allowing mature plants to grow 6-10 inches apart. Try not to disturb the soil around the plants that are to remain (which could cause them to bolt). Eat your thinnings!